A Lion Called Christian is a tale of how the world was different half a century ago. It’s also a tale about how it was the same. It’s not so easy to buy a lion cub these days. It remains easy to warm to them, treat them as companions, and admire the lions they grow into. It’s the story of how two men bought a lion, set him free, and forged a friendship that defied the odds of time, space, and circumstance. It’s the kind of friendship all of us want but fewer get to experience. In the friendship of Christian, Ace, and John, the differences between people and animals get blurred. We have more in common than we think. My goal wasn’t actually to read A Lion Called Christian at this time. I’d read it years ago and picked it up by mistake when I intended to reread a business book by KIND founder Daniel Lubetzky. I’m glad I made the mistake, though. A Lion Called Christian is an easy read. If you’re a fast reader, you might be able to read it all in one trip to the park. More importantly, it’s an uplifting change of pace compared to most of the things you’ll hear about. Imagine going into a big store with a “zoo” department. You see a whole bunch of familiar, but unexpected animals on display. In one cage, you see two lion cubs, a brother and sister, which have been sold from a zoo. That was how the world was different in 1969. What wasn’t so different was that two young men, John Rendall and Anthony “Ace” Bourke, had journeyed to London from Australia on a quest of self-discovery. Chance brought them into Harrods Zoo, where they came across the lion cubs. The female was aggressive and supposedly spoken for, but the male was friendly and instantly captured the affections of Ace and John, a feat he would soon replicate in front of a much wider audience. While one of us talked of our recklessness and the risks, the other spoke of the unforgettable and exciting experience that lay ahead. What finally united us was the staunch opposition from most people we knew to the idea of buying Christian. Unwittingly, they intensified our determination to accept a challenge we might otherwise have resisted. Would the challenge of raising Christian and ultimately finding him a better life for him when he outgrew the space they could provide make them or break them? A Lion Called Christian details all of the exciting, unnerving, and adorable twists and turns in that process. Christian had a good time living with Ace and John above the furniture shop where they worked. He became a local celebrity, with business at the furniture shop improving as a result of his presence. For six months, the three lived happily together. The lions were the star attraction, and Christian’s parents, Butch and Mary, were the most magnificent lions we had ever seen. Despite their restricted living conditions, they looked very healthy. Christian looked very like his handsome, heavily maned, three-year-old father. They were an affectionate couple, but they incessantly paced the floor of their small cage. Ace and John wanted Christian to have a life other than “cement, bars, and boredom.” Things looked bleak on that front, however. A Lion Called Christian is very much illustrative of the subjection of all living things to the will of fortune. If things had only gone a little differently, this particular lion would end up like his parents and not with Ace and John. Fortune threatened him again, until Virginia McKenna and Bill Tavers, of Born Free fame, chanced to come into the furniture shop in search not of lions, but of something for their home. It was through them that Ace and John talked to George Adamson, the famous lion expert, and got the wheels set in motion for an unlikely turn of events – returning Christian to the wild in Kenya. This presented risks, but it also saved their lion from living a cramped existence, so they went for it. Ace and John traveled to Kenya and stayed by Christian’s side as George Adamson introduced him to the wild, getting him ready for the life that would entail. 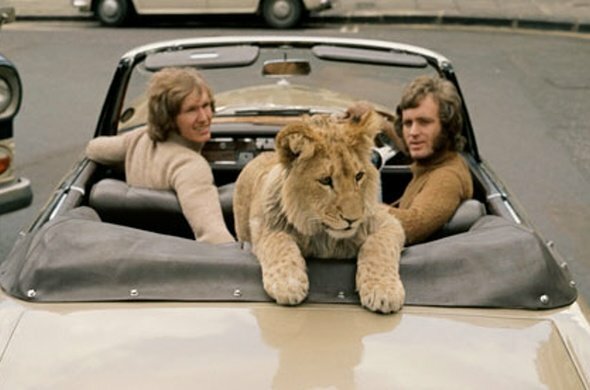 A year later, Ace and John, back in London, wanted to return to see Christian, but George Adamson cautioned that he had doubled in size and might not remember them. Undaunted, as they knew how affectionate he’d been, they made the trip. That’s where we got the footage of the reunion that was a smash hit on YouTube 10 years ago. Something like this doesn’t change in a mere half century. Will you get the experience of that video while reading A Lion Called Christian? No, but it’s still deeply uplifting all the same. In 1973, Christian left for better territories and was never seen again. Ace and John like to think that he found a new home and has descendants alive today, but no one can be sure. All they can be sure of is that they had an unforgettable experience that ultimately proved their worth as men. To immerse yourself in a deeply uplifting experience which will make you forget the cruelty and hysteria in the world today, I highly recommend A Lion Called Christian.